Yellow gold is a class choice for an engagement ring that will stand the test of time. If you're looking for yellow gold engagement ring inspiration, browse a gallery of some of our favorite custom rings below. White gold remains one of the most popular choices for engagement rings, and a perfect choice for for a style that is both timeless and affordable. If you're looking for white gold engagement ring inspiration, browse a gallery of some of our favorite custom rings below. Choose vintage styling for your timeless love story. Browse our stunning collection of rose gold lab created diamond engagement rings. Design a custom engagement ring with conflict-free round brilliant lab diamonds hand selected for quality, fire and brilliance. Shop emerald cut lab grown diamond engagement ring styles. Each Ada Diamonds engagement ring is custom made to order with conflict-free lab grown diamonds. Shop lab grown diamond engagement ring styles. Create your custom lab grown cushion cut diamond engagement ring with conflict-free lab diamonds hand selected for quality, fire and brilliance. Browse our collections for inspiration or inquire today to get started. Lab grown princess cut diamond engagement rings. Choose from the best selection of conflict-free, lab created princess cut diamonds on earth. 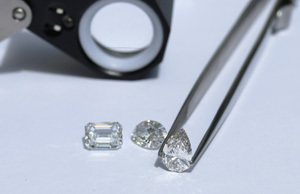 Purchase loose diamonds, or design a custom lab diamond engagement ring or wedding band with a Diamond Concierge. Inquire today. Asscher cut diamonds have similar faceting to emerald cuts with a shape that is more square than rectangular. This vintage style diamond cut features a hall of mirrors effect for a shine and sparkle that is unique from any other diamond shape. Your Ada Diamonds Concierge will help you select the perfect Asscher Cut diamond for your one-of-a-kind bespoke engagement ring. Lab Grown Pear Shaped Diamond Engagement Rings. Elegant and graceful, Ada's lab grown pear brilliant diamonds offer exceptional sparkle in a distinctive shape. Ada's lab created diamonds are guaranteed conflict-free. Design a custom engagement ring or purchase loose diamonds. Inquire today. Shop our stunning collection of sustainable, conflict-free lab grown oval diamond engagement rings. Design a beautiful one of a kind custom engagement ring with the world’s leading purveyor of superlative lab grown diamonds. Timeless appeal, unrivaled sparkle. Design a custom lab diamond engagement ring with conflict-free round brilliant diamonds hand selected for quality, fire and brilliance. Browse our collections for inspiration or inquire today to get started.